"She was wonderful. She was just so loving," a niece remembered of Cynthia Tisdale, who was killed in Friday's shooting at a high school. An exchange student from Pakistan and a substitute teacher with a "lust for life" were among those killed after a 17-year-old gunman allegedly opened fire at a Texas high school Friday morning, killing 10 people before surrendering, family members and officials said. Two teachers and eight students were killed in the shooting, the school district said. Those killed were identified by officials as teachers Glenda Perkins and Cynthia Tisdale; as well as Kimberly Vaughan; Shana Fisher; Angelique Ramirez; Christian Riley Garcia; Jared Black; Sabika Sheikh; Christopher Jake Stone; Aaron Kyle McLeod. Tisdale was substitute teaching at the high school and went back to work about a year and a half ago after her husband was diagnosed with cancer, her sister-in-law Pamela Tisdale said. Cynthia Tisdale was a mother of three and had eight grandchildren, she added. Tisdale's niece, Leia Olinde, told the Associated Press that Tisdale was like a mother to her and helped her shop for wedding dresses last year. "She helped me put it on, she helped fix my hair," Olinde said through tears. "She was wonderful. She was just so loving," said Olinde, 25. "I've never met a woman who loved her family so much." Olinde's fiance, Eric Sanders, said of Tisdale that "words don't explain her lust for life and the joy she got from helping people." Sheikh, an exchange student from Pakistan, was also killed, the Embassy of Pakistan and the U.S. State Department confirmed Friday. She was in the United States on a sponsored youth exchange and study program, a State Department official said. "We send our deepest condolences to Sabika's family and friends," the official said, adding that the U.S. ambassador will be reaching out to the family. Chris Stone's cousin, Michelle Ellerd, confirmed his death to NBC News on Friday. She said then that the family was too exhausted to comment further. The mother of student Kimberly Jessica Vaughan confirmed to NBC News that her daughter was among those killed in the shooting. "Folks-call your damn senators. Call your congressmen. We need GUN CONTROL. WE NEED TO PROTECT OUR KIDS. #kimberlyjessica," Kimberly's mother, Rhonda Hart, wrote on Facebook before changing her profile picture to one of her and her daughter. Mark Armstrong, who said he was Angelique Ramirez's cousin, said he was at the vigil on Friday when he discovered that the 17-year-old junior had died. "She was a sweet young girl. Very family-oriented. She didn’t deserve nothing like this," he said. "She was very involved in art ... She was loving and caring." The Houston Chronicle first reported on Saturday that 17-year-old Jared Black was among the dead. "He was a momma's boy," said Lea Gallaway, a member of Black's church. "He was a goofy kid. He was just real outgoing." Reports of an active shooter at Santa Fe High School were made to police just after 7:30 a.m. local time (8:30 a.m. ET), police said. Suspected gunman Dimitrios Pagourtzis, 17, exited an art classroom and surrendered at around 8:02 a.m. local time, police said in court documents. Police said he gave a statement admitting that he had shot multiple people inside the school with the intention of killing them. Pagourtzis is charged with capital murder and aggravated assault against a public servant. He is being held without bail. Pagourtzis' family in a statement on Saturday said that they are "as shocked and confused as anyone else" and expressed condolences to the victims and their families, and they also thanked first responders. "We are gratified by the public comments made by other Santa Fe High School students that show Dimitri as we know him: a smart, quiet, sweet boy," the family said. "While we remain mostly in the dark about the specifics of yesterday’s tragedy, what we have learned from media reports seems incompatible with the boy we love." "We share the public’s hunger for answers as to why this happened, and will await the outcome of the investigation before speaking about these events. We have been and will continue to cooperate with the authorities conducting the investigation, and ask for the public’s patience while it moves forward," the family said. Thirteen people were injured in the shooting, the FBI said Saturday. One of those wounded was Santa Fe Independent School District Police Officer John Barnes. Barnes is in "critical but stable" condition, Santa Fe ISD Police Chief Walter Braun told reporters Saturday. He said that two officers “engaged him right away," referring to the suspected shooter. "Our officers went in there and did what they could," Braun said. "They did what they’re trained for, and went in immediately. And it’s a tragic event for everybody involved." 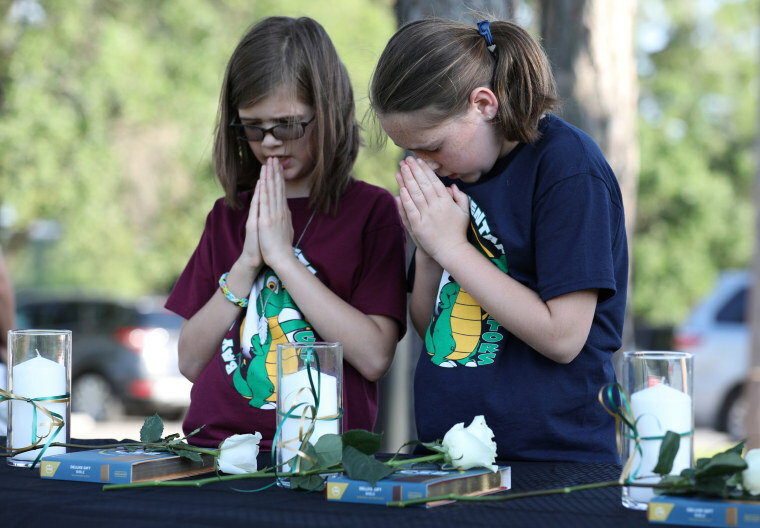 At a prayer vigil held in Santa Fe Friday, the school district superintendent said that school counselors would be on hand to help students, their families and others affected by the tragedy. ‘No one is immune’: Experts say school shooting underscores new normal in U.S.
"I want you to know that as we gather here in Santa Fe tonight, the entire state of Texas embraces you, supports you, and prays for this entire community," Texas Gov. Greg Abbott said at the vigil. The Houston Astros baseball team held a moment of silence before Friday’s game. "We send our thoughts and prayers to the families of those affected by the senseless tragedy at Santa Fe High School today," the team said on Twitter. Houston Texans star defensive end J.J. Watt has offered to pay for the funerals of all 10 victims in Friday’s shooting, Amy Palcic, senior director of communications for the Texans, confirmed Friday night.